Days of adventure and exploring unique attractions awaits up to 6 guests at this vacation rental! 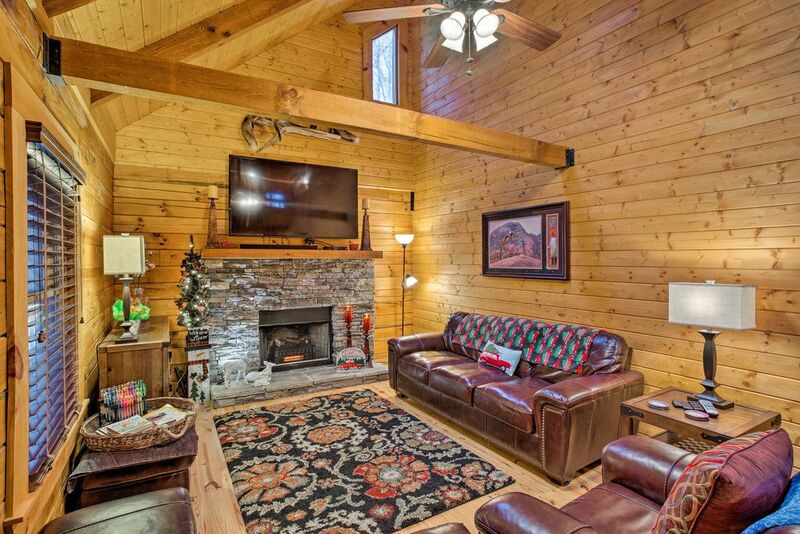 Resting just 1 mile from the Maggie Valley Festival Grounds and even less from the Wheels Through Time Museum, local eateries, and shops, this 2-bedroom, 2-bath cabin features rustic touches with all the modern conveniences of home - including Smart TVs, free WiFi, and more. Spread out and enjoy the great outdoors on the covered, wraparound deck, host family BBQs, and venture through the mountains! Tall trees and peaceful surroundings welcome you to your hidden, Maggie Valley cabin, Robins Nest. On nice days, spend countless hours unwinding on the spacious porch, start up the charcoals, and enjoy an outdoor family feast! A creek runs directly behind the cabin, setting a serene environment for relaxation. Inside, exposed beam vaulted ceilings and a stone (electric-start) fireplace add the rustic touches you'd expect of a cabin getaway. Enjoy family favorites on the flat-screen Smart TVs, as the group's designated chef utilizes the fully equipped kitchen for 3-course meal prep. You'll have all the essential appliances, cookware, dishware, and more. Head up to the loft/office space and cozy up with a good book before calling it a night. The master bedroom boasts a king-sized bed while the 2nd bedroom includes a queen bed. After starting your day with a cup of coffee by the creek, make your way into town for an adventure! The Maggie Valley Festival Grounds lies just a mile up the road and hosts a variety of events throughout the year. Gearheads will want to take the time and visit the Wheels Through Time Museum, home to 300+ rare motorcycles and other exhibits. In this area, you can dine at local favorites like Carver's, J. Arthur's, and Snappy's, and shop unique boutiques like Maggie Mountaineer Crafts and Jack's Leather Shack. Endless outdoor recreation awaits in the Great Smoky Mountains National Park, roughly a 40-minute drive away. If you're traveling in the winter, pack your gear and make the quick 15-minute drive to Cataloochee Ski Area, providing runs for all skill levels, snow tubing, and much more. This cabin is among the best that we have ever stayed. All the things you need from linens to cookware. There are smart TVs in every room too. The wrap around porch is ideal with lots of outdoor seating, a grill and a view of a mountain stream. We will stay here again for sure. This property was clean, beds comfortable, linens nice, and all over relaxing. Would stay again. My husband and I stayed for the weekend and enjoyed this beautiful home so much, we are already talking about going back soon. The bed was comfortable, house was clean and everything we needed and more was assesable. We definitely enjoyed our stay and will be back soon! The cabin more than met our expectations! Everything was beautiful, and organized....very clean! Everything in the cabin is relatively new. It truly felt like home away from home! We thoroughly enjoyed the peaceful feel of the cabin, we also loved the fireplaces, and the serene wraparound porch that over looks the creek. Best Cabin stay I’ve had in the past 10 years. The cabin is superb in every way. It sits in an absolutely beautiful location and is bridled with a spectacular wrap-around porch. Upon entry it quickly becomes obvious that every amenity has been thought of and included, making this home away from home a true gem in Maggie Valley. I will most definitely be staying here, again. - Jason B. Most adorable comfy CABIN on the mountains! This cozy retreat was a gem! The owners paid attention to every detail to make our stay grand!! Just when I thought the comfort level couldn’t get better...there’s a creek outside. I could hear the water from my bedroom! My friends and I loved the central location and agreed we would stay at this cabin over and over again!